Meet the World's Funniest kid—Junie B. Jones! With over 60 million books sold and heralded as "the darling of the young-reader set." by USA Today, the New York Times bestselling Junie B. Jones series is a classroom favorite that has been keeping kids laughing–and reading–for over 20 years. Barbara Park has won multiple children's choice awards and been featured on the Today Show and in The New York Times, USA Today, and Time magazine. As Publishers Weekly says, "Park convinces beginning readers that Junie B.–and reading–are lots of fun." With thirty titles and translated into over a dozen languages, Junie B. Jones continues to win the hearts of young readers–and their grownups– all over the globe. Find out why over 60 million readers love the New York Times bestselling Junie B. Jones series. JunieBJones.com and Random House Children’s Books are committed to providing a safe and secure online experience for children. Designed with children 6–9 in mind, the site does not feature social networking or online chatting, thereby discouraging children from revealing personally identifiable information. The Junie B. Jones Parent Newsletter requires users to provide a parent’s email address and parent's birthday in order to sign up for the list. We use this information to send the parent notifications on Junie B. Jones news. We do not sell or share any personal information provided to us on the Junie B. Jones web site. Hurray! Hurray! If you’re looking for the You Must B. Joking! page, you’ve come to the right place! 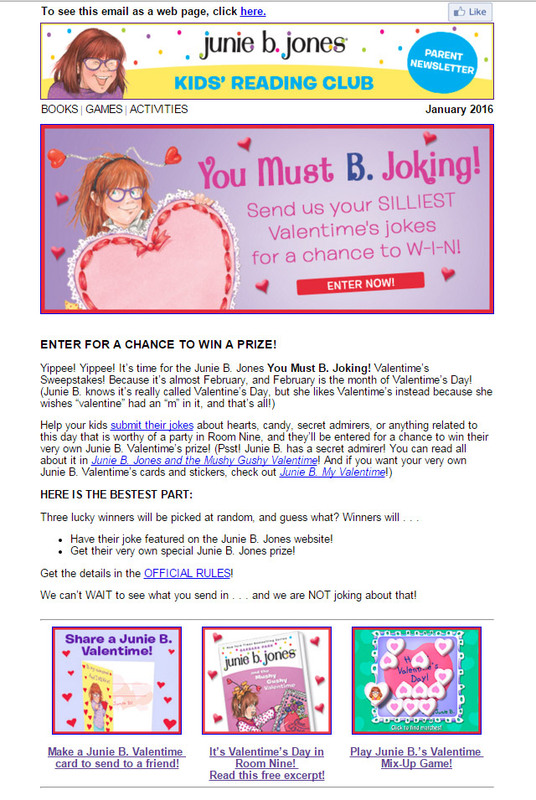 There’s no sweepstakes right now, but you can enter your FUNNY JOKES anytime at all on the Junie B. Jones homepage! Then keep checking back to see if your joke made it to the latest and greatest jokes page! NO PURCHASE NECESSARY. Enter between 12:01 AM (EST) on January 22, 2017, and 4:00PM (EST) on February 1, 2017. Open to residents of the fifty United States and the District of Columbia who are 18 and older. Winners will be selected at random on or about February 1, 2017. Odds of winning depend on number of eligible entries received. Void where prohibited or restricted by law. See Official Rules for full details. 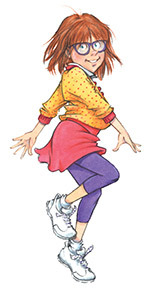 Keep connected with all things Junie B.! We’ll send you monthly updates about new books, fun printables like holiday cards, Junie B. games and activities, special events, sweepstakes, and more! Sorry, there was a problem and we could not process your submission at this time. Please try again later. http://jratzan.weebly.com. "You are not the boss of my words, Grace," I said. "This is a freed country. And if I want to say valentime, I can. And I will not even go to jail." "Not the way I want my kids talking!" writes one reviewer on the online bookstore Amazon.com. "Children learn by example and will pick up on the good and bad habits that they see and hear, so why would anyone want his/her child exposed to this constant stream of sloppy language?" asks another. Barbara Park's Junie B. Jones beginner chapter book series, which follows "almost six"-year-old Junie B. through a new baby in her family, special occasions at school, and other day-to-day events, has been challenged in Colorado, Texas, Wisconsin, and other states. Park appears sixth on the American Library Association's list of the ten most frequently challenged authors of 2004.1 Many complaints, like the ones quoted above, focus on Junie B. 's use of non-standard English. Linguistics can help readers appreciate Junie B., and Junie B. can inspire readers to learn more about linguistics. Before beginning this discussion, a few qualifications are in order. First, this paper reflects a particular approach to linguistics called generative grammar, a theory that assumes language is a systematic, innate human trait driven by certain mathematical principles (specifically, language is a combinatorial, productive, and recursive system).2 Second, most rules and other properties mentioned here have been simplified from versions a linguist would use. In particular, linguists see important differences between spoken and written language; because these books read as though Junie B. is telling a story, this article treats Junie B. 's written narration as if it were made up of spoken words. Additionally, because Junie B. 's grammar becomes more standard when she enters first grade in later books, this discussion focuses on the seventeen books in which Junie B. is in kindergarten. The idea that language follows rules should not come as a surprise; in fact, this is a major assumption behind complaints that Junie B. is breaking such rules. But thinking like a linguist leads to the surprising conclusion that Junie B. isn't breaking any rules at all—she's actually following them completely, unlike most speakers of standard English. Looking at matters this way, Junie B. 's speech can be seen as clearer and more logical than the standard speech to which it is compared. To make a verb past tense, add -ed to the end of it. Examples: walk + ed = walked; jump + ed = jumped. Although all of the above are examples of logical rule-following, the second, "beated," is the most interesting. In addition to being logical, this form is actually clearer than its counterpart in standard English. As linguist Steven Pinker points out, verbs like "beat," which have the same form in both present and past tense, are ambiguous; whether they're being used to mean present or past actions can be unclear.5 Speech like Junie B. 's, which uses a different form to indicate past tense, actually makes much more sense. To form the comparative and superlative forms of adjectives, add -er and -est to them. Examples: big + er = bigger; fast + est = fastest. To form a reflexive pronoun, add -self or -selves to the possessive form of that pronoun. Examples: my (possessive) + self = myself; your (possessive) + self = yourself; our (possessive) + selves = ourselves. "Big girls get to walk all by theirselves"
The first syllable of words is the stressed syllable. Although this pattern is not true of all English words, it tends to be true of words that young children hear most often, and is true of many words that Junie B. herself uses. "I HURried to the LAUNdry room to get the CLOTHESpins"
This is not as odd as it first seems; when adults talk quickly, initial unstressed syllables can be hard to hear. For example, this author recently fielded a request from a child for books about "noles" (the child meant "aNOLES," a type of lizard often kept as class pets). Finally, this last rule seems obvious, but has many interesting consequences: People say things that make sense. Based on the above, it seems that Junie B. 's grammatical errors are far from random—they come from following rules of English grammar and conversation to the letter of the law. A thoughtful challenger, however, could reply that the key here is Junie B. 's ignorance of the many rule exceptions present in standard English. Interestingly, much of what appear to modern English speakers as "exceptions" are actually living fossils of long-forgotten rules. For example, Old English and its predecessors had a rule that made a verb past tense by changing its vowel; echoes of this rule still exist in words like "sing," which becomes "sang" in the past tense.13 However, Junie B. 's strict rule-following can also be looked at in another way. Most likely, no one has explicitly taught her any of the above rules. She, like most young children, has derived them entirely on her own. This process, not her lack of memorized exceptions to rules, can be seen as what is truly amazing about Junie B. Jones' grammar. "I climbed onto my bed." The verb "climbed" might have sounded as strange to Milton and other speakers of early modern English as "runned" sounds to us today. So can we argue that when Junie B. says "I quick runned" instead of "I ran quickly," she's actually working toward regularizing verbs and combining adjectives and adverbs?19 Not really, since one speaker alone doesn't constitute overall change. But, as was the case with language rules discussed previously, viewing Junie B. 's speech from the perspective of language change leads to a more interesting—and more satisfying—interpretation than simply rejecting it offhand. And her individual usage does provide evidence for another claim: language is learned at special times and in special ways. Child language acquisition—how children learn their first language—may be the area of linguistics most of interest to children's librarians.20 The process of learning a first language is an incredible one, involving skills such as deciphering where words begin and end, determining what roles words play in sentences, and, of course, deciding what words mean. Because this daunting task is usually accomplished within the first few years of a child's life, and typically with little or no explicit instruction, linguists posit the idea that children are born with an internal language mechanism of some kind, allowing them to fit what they hear into an innate mental framework. Pinker and many other linguists believe that such frameworks involve both systematic rules, like the "add -ed" rule, and individual words, like "cat," "dog," and "ran," which must be memorized individually. These two elements combine in particular ways to yield standard grammatical speech. For example, if a rule and a word conflict, like "ran" and "add -ed," an adult speaker will retrieve the word from memory in time to stop the rule from applying. Although these examples could be lamented by critics as the most objectionable examples of "bad grammar" in the series, they can also be viewed as the best demonstrations that language is made up of words, rules, and ways of putting the two together. A child who utters statements like the above knows the rules for forming past-tense and superlative forms ("add -ed" and "add -est") and knows special words (like "best" and "stole")—the child has simply not yet mastered the idea that using one should inhibit using the other. This theory of language learning partially addresses the complaint given at the beginning of this article, that impressionable youngsters "learn by example" and will imitate the grammar that they read and hear. According to this theory, children are not blank slates but filters. They will only imitate what fits with their internal language frameworks. For example, a child (or an adult!) can easily learn a new word like "mondegreen" (introduced in part I above) because it does not interfere with what their language framework says is acceptable but will balk at a word like "runned" because it does. From the victory at the heart of Ed Emberley's Go Away, Big Green Monster! (Little, Brown, 1993) to the thrill of watching Harry Potter and friends defeat inept and evil grownups, children love books that make them feel smart, powerful, and in control. Most likely, this effect is responsible for part of Junie B. Jones' appeal. As noted above, the target audience for these books, early elementary school readers, has typically outgrown the speech patterns of younger children. Readers in this age group can therefore laugh with smug self-assurance at Junie B. 's childish way of talking, boosting their own sense of linguistic superiority. In fact, the relationship between language and power forms the crux of what Junie B. would call the "disagreedment" over her use of English.28 While skeptics may concede that Junie B. 's speech is logical, clear, and in tune with patterns observed in language change and language acquisition, the fact remains, they could argue, that it is not standard English. Although Junie B. truly "will not even go to jail" for speaking in a non-standard way, American society regards standard English as the right way to talk, and those who speak this way will be treated with more respect than those who do not. By presenting such an argument, these critics would be correct. Again, however, linguistics allows us to think beyond our everyday assumptions about the idea of a "right" way to talk. What makes one style of speech "right," especially when the "wrong" one is the more logical of the two? The answer is that the "right" form of English is the one used by people in positions of power. Historically, socioeconomic and political power acted as deciding factors. For example, when London became the economic and cultural center of Britain in the seventeenth century, the particular dialect of English spoken by Londoners—the precursor of today's standard English—became the "correct" way to speak English. Speaking this way was desirable because it allowed one to identify oneself with the upper class living there. Social and cultural issues continue to affect attitudes toward language. The English of the rich Northeast is often regarded as "better" than that spoken in less economically privileged areas of the United States, and language columnists like William Safire use their power as cultural authorities to dictate what is considered "proper" speech. The four properties of language discussed above go far in showing that Junie B. 's English is much more complex and interesting than a simple label of "sloppy language" would suggest. But, as observant readers know, the examples shown above are not the only oddities in Junie B. 's speech. Principles of linguistics can also explain Junie B. 's habit of referring to her friend as "that Grace" (a spectacular example of a phenomenon known as case-marking), her use of a rhyming device called reduplication ("yucky blucky," "stewie pewie"), her repetitive phrases ("whole entire," "plus also"), her odd application of past participles ("This is a freed country," as quoted at the beginning of this article), and numerous other aspects of her speech.30 Even more strikingly, the fact that non-linguist Barbara Park can create such a linguistically interesting character raises the provocative possibility that successful writers may possess an implicit understanding of linguistics. If the Amazon.com reviews and book challenges are any indication, children's librarians should be prepared to defend the inclusion of the Junie B. Jones books in their collections. Explaining this series' unique features through the lens of linguistics provides one way of doing so. Independent of outside challenges, we librarians improve both our own and our patrons' appreciation of children's literature when we seek to understand it from a variety of perspectives. And those of us who also teach, or who work with classroom teachers, can easily imagine the extraordinary language lessons that these books can inspire. Perhaps thinking about language in this way will even inspire some readers to pursue linguistic inquiries of their own. As Junie B. would say, "Wowie wow wow!" Junie B., First Grader: Jingle Bells, Batman Smells! (P.S. So Does May), 2005 Love Language? Tedd Arnold, More Parts and Even More Parts: Idioms from Head to Toe (Dial, 2001 and 2004). Wallace Edwards, Monkey Business (Kids Can Press, 2004). Roald Dahl, The BFG, illus. Quentin Blake (Farrar Straus and Giroux, 1982). Shel Silverstein, Runny Babbit: A Billy Sook (HarperCollins, 2005). William Steig, CDB! and CDC? (Windmill, 1968 and Farrar, Straus and Giroux, 1984; revised editions Simon and Schuster, 2000 and Farrar, Straus and Giroux, 2003). References and Notes 1. Customer reviews of Junie B. Jones and the Stupid Smelly Bus by Barbara Park. Accessed June 26, 2005, www.amazon.com; Library Research Service, Colorado State Library and the Colorado Department of Education, "Challenges to Materials and Services in Colorado Public Libraries, 2003." Accessed June 26, 2005, www.lrs.org/documents/plstat_03/challenges_details_03.pdf; American Civil Liberties Union of Texas, "Free People Read Freely: An Annual Report on Banned and Challenged Books in Texas, 2003-2004." Accessed June 26, 2005, www.aclutx.org/pubed/bannedbooks/bannedbooksreport.pdf; "Wisconsin School District Retains Junie B. Jones, Black Lagoon Books," American Libraries Online, Dec. 20, 1999. Accessed June 26, 2005, www.ala.org/ala/alonline/currentnews/newsarchive/1999/december1999/Default823.htm; American Library Association, "The Most Challenged Books of 2004." Accessed June 26, 2005, www.ala.org/ala/oif/bannedbooksweek/challengedbanned/challengedbanned.htm. 2. Steven Pinker, Words and Rules: The Ingredients of Language (New York: Basic Books, 1999), 6-8. 3. Barbara Park, Junie B. Jones and That Meanie Jim's Birthday (New York: Random House, 1996), 19. A general argument defending the use of strong words in children's books can be found on pages 179-91 of Language Matters: A Guide to Everyday Questions about Language (New York: Oxford Univ. Pr., 2003), written by linguist and children's fiction author Donna Jo Napoli. 4. Park, Junie B. Jones is Captain Field Day (New York, Random, 2001), 20; Park, Junie B. Jones and Some Sneaky Peeky Spying (New York, Random, 1994), 9; Park, Junie B. Jones Has a Peep in Her Pocket (New York, Random, 2000), 38. 5. Pinker, Words and Rules, 194. 6. Park, Junie B. Jones Loves Handsome Warren (New York: Random, 1996), 1; Park, Junie B. Jones and Her Big Fat Mouth (New York: Random, 1993), 61; Park, Junie B. Jones Has a Monster Under Her Bed (New York: Random, 1997), 61. 7. Park, Junie B. Jones and Some Sneaky Peeky Spying, 26; Park, Junie B. Jones is (Almost) a Flower Girl (New York: Random, 1999), 62. 8. Park, Junie B. Jones and the Yucky Blucky Fruitcake (New York: Random, 1995), 29; Park, Junie B. Jones and Her Big Fat Mouth, 13, 31. 9. Park, Junie B. Jones Has a Peep in Her Pocket, 1; Junie B. Jones and the Yucky Blucky Fruitcake, 4; Park, Junie B. Jones Is (Almost) a Flower Girl, 7. 10. Park, Junie B. Jones and a Little Monkey Business (New York: Random, 1993), 21, 63. 11. Park, Junie B. Jones and Her Big Fat Mouth, 33; Park, Junie B. Jones is a Beauty Shop Guy (New York: Random, 1998), 45; Park, Junie B. Jones and Some Sneaky Peeky Spying, 36. 12. Pinker, The Language Instinct: How the Mind Creates Language (New York: Morrow, 1994), 156, 271. 13. Pinker, Words and Rules, 48, 67-68. 14. Park, Junie B. Jones Has a Peep in Her Pocket, 15; Park, Junie B. Jones and That Meanie Jim's Birthday, 85. 15. Department of Linguistics, Ohio State University, Stephanie Jannedy, Robert Poletto, and Tracey L. Weldon, eds., Language Files: Materials for an Introduction to Language and Linguistics, 6th ed. (Columbus, Ohio: Ohio State University Press, 1994), 321. 16. John Milton, Paradise Lost (London: Peter Parker, Robert Boulter & Matthias Walker, 1667), bk. IV, lines 192-193. 17. Donna Jo Napoli, Language Matters: A Guide to Everyday Questions About Language (New York: Oxford Univ. Pr., 2003), 180; Napoli, Linguistics (New York: Oxford Univ. Pr., 1996), 320. 18. Park, Junie B. Jones Smells Something Fishy (New York: Random, 1998), 15; Park, Junie B. Jones Is a Graduation Girl (New York: Random, 2001), 55. 19. Park, Junie B. Jones Is a Beauty Shop Guy, 40. 20. See Betsy Diamant-Cohen, Ellen Riordan, and Regina Wade, "Make Way for Dendrites," Children and Libraries 2, no. 1 (Spring 2004); Lynn Akin and Donna MacKinney, "Autism, Literacy, and Libraries," Children and Libraries 2, no. 2 (Summer/Fall 2004); and MaryKay Dahlgreen, "Ready to Read in Oregon," Children and Libraries 2 no. 3 (Winter 2004). 21. Pinker, Words and Rules, 130, 198-200. 22. Park, Junie B. Jones is Captain Field Day, 4; Park, Junie B. Jones Smells Something Fishy, 7; Park, Junie B. Jones is a Graduation Girl, 16. 23. Park, Junie B. Jones Is Not a Crook (New York: Random, 1997), 3, 25. 24. Pinker, Words and Rules, 199. 25. Park, Junie B. Jones is a Graduation Girl, 17. 26. Median calculated based on reviews of Junie B. Jones and the Stupid Smelly Bus (Nov. 1992), Junie B. Jones and Some Sneaky Peeky Spying (Oct. 1994), Junie B. Jones Has a Monster Under Her Bed (Nov. 1997), Junie B. Jones is Not a Crook (Nov. 1997), Junie B. Jones is a Party Animal (Jan. 1998), and Junie B. Jones is a Beauty Shop Guy (Dec. 1998), all from School Library Journal, dates as shown. 27. Joel Lachter and Thomas G. Bever, "The relation between linguistic structure and associative theories of language learning: A constructive critique of some connectionist learning models," Cognition 28, no. 1-2 (March 1988): 195-247. 28. Park, Junie B. Jones and the Mushy Gushy Valentime (New York: Random, 1999), 29. 29. Pinker, Words and Rules, 200. 30. Park, Junie B. Jones and Some Sneaky Peeky Spying, 19, 36; Park, Junie B. Jones Is a Party Animal (New York: Random, 1997), 3, 57; Park, Junie B. Jones and the Mushy Gushy Valentime, 9. 31. Dr. Seuss, The Sneetches and Other Stories (New York: Random, 1961); Lewis Carroll, Through the Looking Glass and What Alice Found There (London: Macmillan, 1872), ch. 1; Peggy Parish, Amelia Bedelia (New York: Harper and Row, 1963); Maurice Sendak, Outside Over There (New York: HarperCollins, 1981); Beverly Cleary, Ramona the Pest (New York: Morrow, 1968), 173. Copyright © 1995-2018 Penguin Random House LLC. All rights reserved.